Successfully Added DVB-T Digital TV and Analog TV In-Car LCD Receiver (7 Inch) to your Shopping Cart. DVB-T Digital TV and Analog TV In-Car LCD Receiver (7 Inch). This is a superb dual function portable TV Player for in-car use capable of receiving both Digital TV (DVB-T) and Analog TV signals. With an impressive 7 Inch LCD screen providing crystal clear visuals for you to enjoy your TV, this great device gives you the convenience of watching TV while you are on the road using the supplied car charger. Coming with a user-friendly menu system, this is a great portable device that lets you watch your favorite terrestrial TV channel, digital or analog - never miss another minute of your favorite show again! With a built-in media player and EPG functions, the CVFQ-E25 is the perfect mix of versatility and functionality, giving you easy access to all the local terrestrial TV channels. The USB slot provides easy connectivity for your favorite multimedia files, while the supplied mounting bracket lets you conveniently locate the TV Player inside your car for the best possible view. Watch the news, the latest TV shows or live sports on the road with this great portable DVB-T and Analog TV Player. Enjoy crystal clear digital and analog TV together with your family and friends while in the comfort of your car. This would be perfect for you and passengers during long journeys, vacations, road trips or regular commutes. With superb dual TV functionality, crystal clear visuals and a spacious 7" screen, the CVFQ-E25 would also be the perfect gift for anyone who loves the freedom and convenience of both portable digital and analog TV in your home or work vehicle. Note: This product supports the DVB-T digital TV format used in Europe and certain other regions of the world. It will not work in North America. 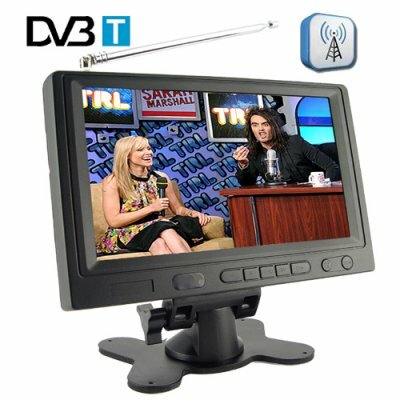 Does this Digital TV and Analog TV In-Car Player work in North America? Although the system is capable of receiving analog TV in North America, the continent uses a different digital TV standard (ATSC) so the system will be unable to receive digital TV channels in North America. on 2009-12-27 06:46:44 Verry good and innovative with market potential. Verry good and innovative with market potential.Another success evidence of Chinese expertise.